Google Analytics is one of the most used analytics tools. It’s used by some 28 million websites worldwide. It’s an easy tool to use and comes with no cost. On one hand, when you effectively track your website’s traffic, sales, and revenue, you will start to understand your target audience better. You’ll ultimately drive more website growth. On the other hand, not tracking your website’s metrics is a huge disservice to your business. And of course, when you first start out you need to learn how to use any analytics tool. For a sophisticated analytics tool like Google Analytics, it won’t be of much help if you don’t know how to use it and what to track with it. More importantly, the insights that you draw from the analytics make all the difference. The truth is, not many people know what metrics to measure and how to make sense of them. I’ll show you how. But first, let’s get the basics out of the way. Businesses make a lot of mistakes when using Google Analytics. Some of them confuse views with visits while others aren’t sure of causation and correlation. But the biggest mistake that businesses make is that they use the tool to track website traffic – and that’s all. For them, Google Analytics is all about seeing how much traffic your website gets every month (or week). They never go beyond this single metric. According to Jayson DeMers, “most of the inexperienced users only rely on a single and most familiar metric.” This strategy is acceptable for a few months when your business is new, but relying on a single metric after 6 months could hinder your business’ growth. In reality, Google Analytics helps you measure a whole lot of metrics (both vanity and actionable metrics) which you need to make informed decisions on the direction that your website is going. For instance, the “User Behavior Analysis” helps you understand what users do when they arrive at your website. The behavior analytics reveals metrics like visitor flow, exit pages, events, what actions visitors take on your website, and you can experiment with different types of behavioral patterns. If you want to improve your search rankings, you’ve got to understand that measuring the behavior of website visitors is more crucial and meaningful as compared to simply tracking the monthly visits and new sessions. For instance, if you’re getting a lot of traffic but the conversion rate is under 1%. No matter how large that 1% might be, I don’t think it’s encouraging. So what are you expected to do? Well, this is where behavior analytics comes to the rescue. 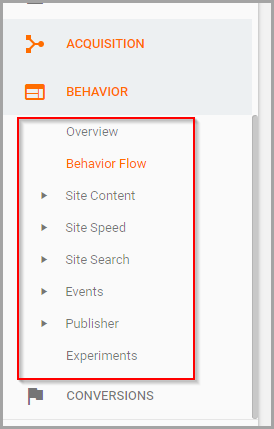 The “Behavior Flow” metric will show what visitors did when they’re on your website, the page they exited and what type of content they like the most. Could this be the best use of Google Analytics? If you optimize for both of them and make decisions based on them, you’ll not only improve your rankings in the SERPs, but you’ll dramatically boost user engagement and experience. Yes, they’re that powerful! If you’re just starting out, bounce rate is the percentage of visitors who leave your website after viewing a single web page. According to Google, a bounce is a single-page session. It’s calculated by dividing all the single-page sessions by total sessions. The answer is converted to a percentage. Bounce rate can be found at several places inside your Google Analytics account. 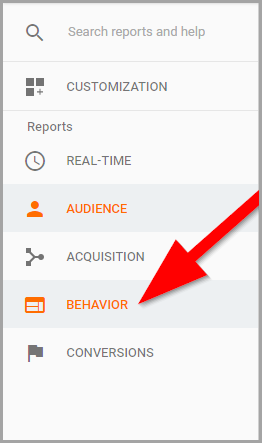 It’s available in the Audience Overview, which is the first thing you see when you login to your Analytics account. However, this is an average bounce rate for all your web pages combined. You need to check bounce rates for individual web pages (including posts and pages) to be 100% sure. And to do that, click on Bahavior > Site Content > All Pages. 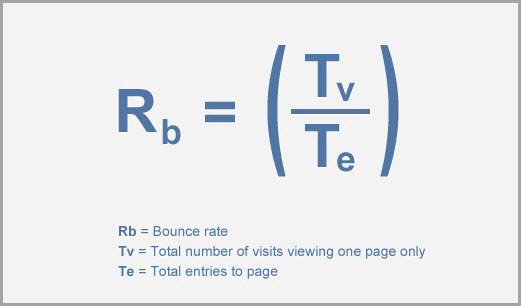 Seeing the bounce rate in Google Analytics isn’t a big deal, you already knew it. But the steps that you take after viewing your bounce rate is what will determine whether you have opportunities to boost your organic search visibility or simply continue with what you’re already doing. 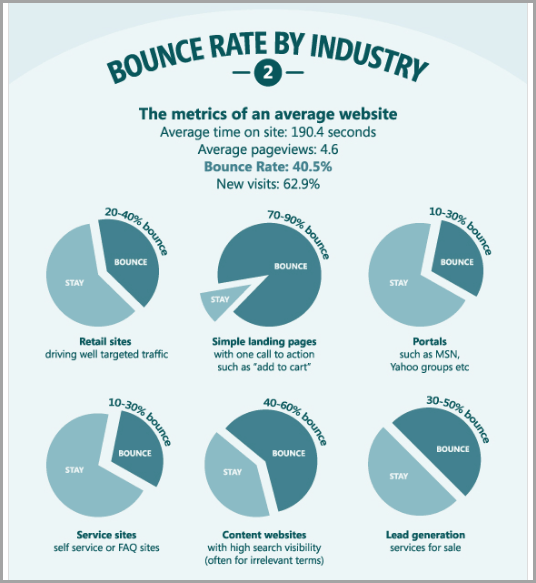 So, if your website had a 64% bounce rate, what does it mean and what are you expected to do? The first step is to compare it with the industry average bounce rate. Bear in mind that finding an accurate average bounce rate for every industry is somewhat impossible. But there are several sources that will help you make a rough guess. 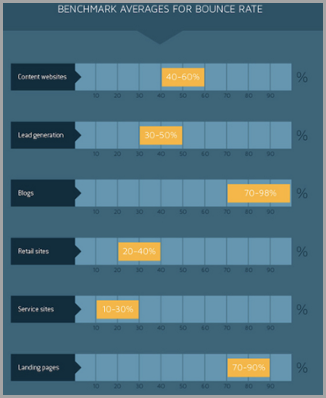 The infographic may not be clear, but if you have a blog, expect a bounce rate between 70% and 98%. It’s quite normal to have a high bounce rate if you have a blog. A high bounce rate isn’t always bad. Better yet, bounce rate isn’t a ranking factor. Not every website uses Google Analytics so Google can’t measure the bounce rate of those websites. Thus, it’s not a ranking factor. Then how can you improve your search rankings with bounce rate? Before you can reduce bounce rate, you need to understand a critical factor that sends a clear signal to Google on the state of your content. It’s referred to as Pogo-sticking. In a nutshell, it’s a situation whereby a user clicks on a search result and quickly goes back to the search engine, clicks on the next result, returns back, and so on. They are looking for a website that satisfies their query. The best SEO ranking factor of all time is user satisfaction. Google (and other search engines) may not truly measure correctly the causes of bounce rate on your website, but the effect of pogo-sticking makes it easier to measure. Because Google can now assume that your web page doesn’t have useful information for the user. 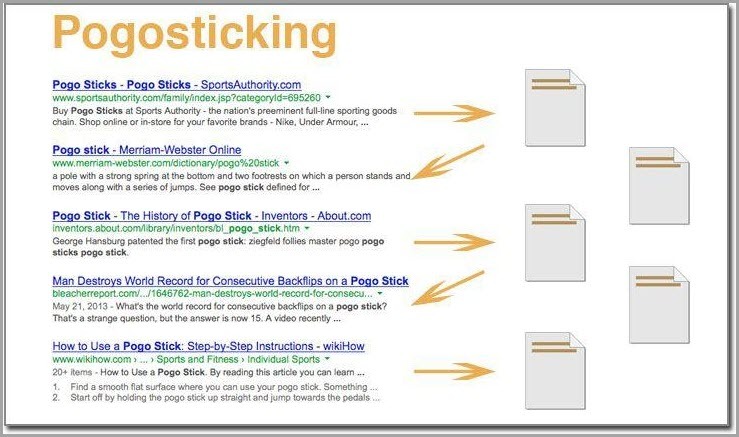 The moment you’re able to stop search users from clicking back and forth on search results, you’ll eliminate pogo-sticking from your web asset, and have a much better chance of reducing bounce rate. Rand Fishkin has explained how to solve the pogo-stick problem. If you get rid of pogo-stick and improve user experience ― this will send a signal to Google that users are now happier with your web page. Your content is now useful and well-researched. You no longer write on generic topics, but rather, you go in-depth. And you have a great navigation and internal structure ― which allows website visitors to click-through to another page while getting answers to their questions. It’s beyond creating quality content. Because the word “quality” is relative. What I perceive as quality content may not impress you at all. Therefore, the solution is to create content that addresses your customer’s questions. You want them to read the article, watch the video, listen to your podcast, and not consider another resource or blog. Make no mistake about it, improving user experience is a surefire way to cut bounce rate in half and grow your organic visibility. 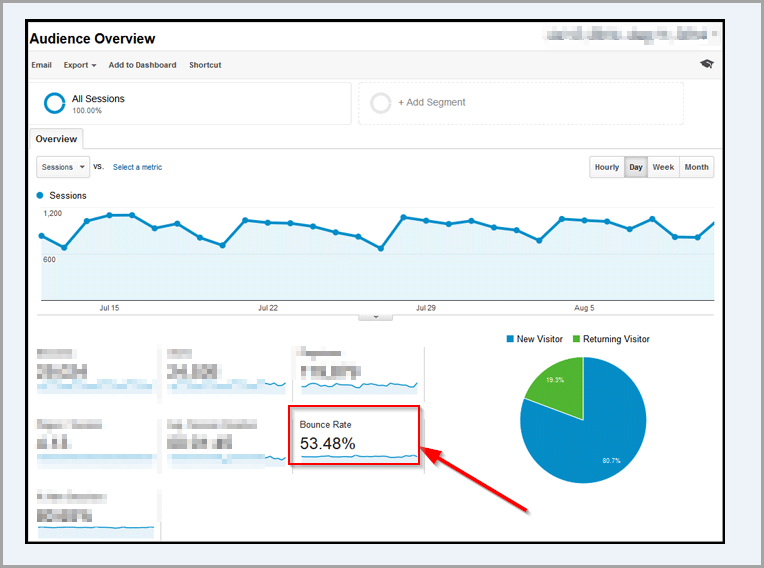 As proof that it works, Elite-Strategies used website design and user experience to reduce the bounce rate of their client by 55% and increased organic traffic by 2x. Google defines a session as a group of interactions on your website at a specific time period. 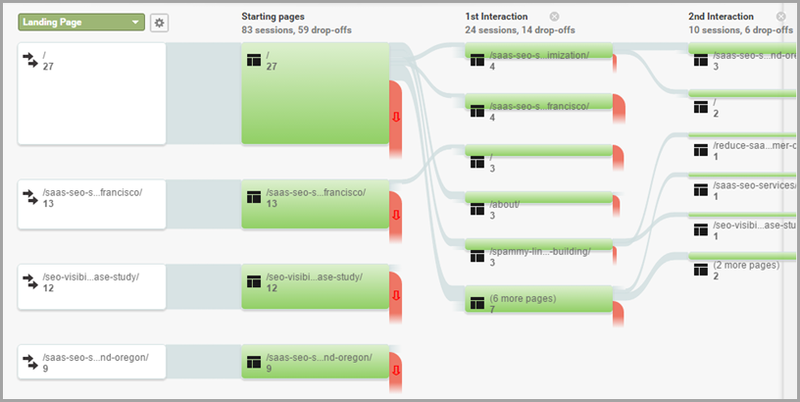 When one session ends, the next time the same user returns to your website it will count as a new session. After inactivity of 30 minutes, the session expires and it will then be counted as a new session. The Percent of New Sessions is the measure of percentage of first-time visitors to your website. 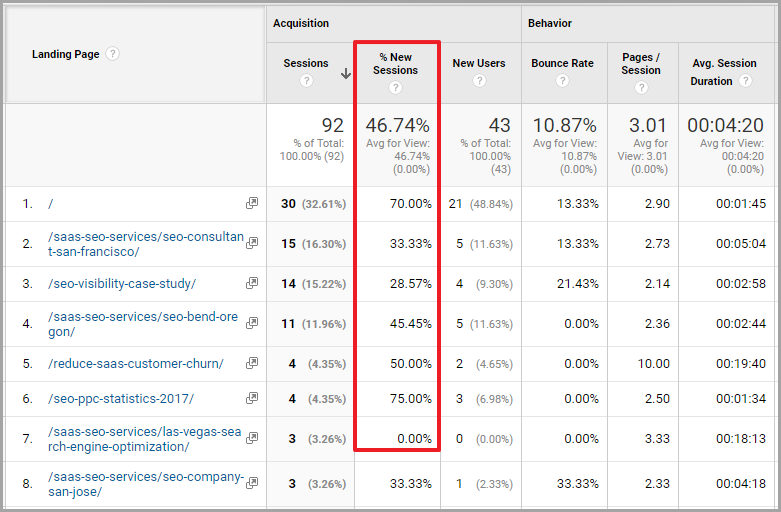 The percent of new sessions can be found in Google Analytics in Audience > Overview. You can find the % New Sessions for individual pages in Google Analytics. Click on Behavior > Site Content > Landing Pages. So how you can use this to increase search rankings? 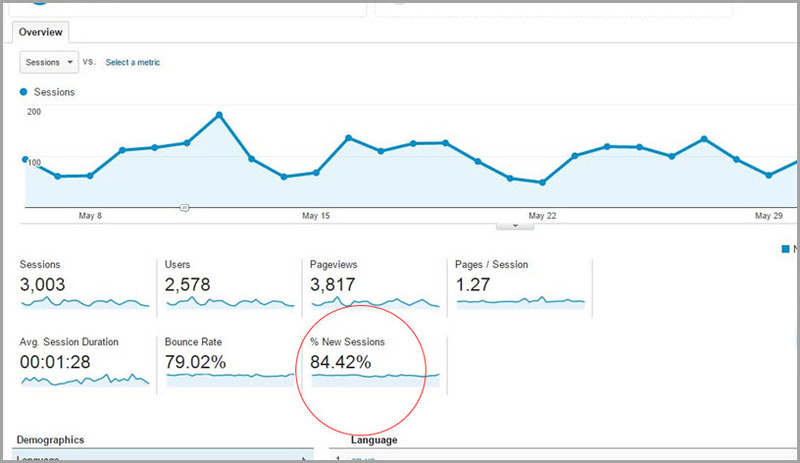 First, did you know that the Percent of New Sessions is an engagement metric? It’s a measure of user satisfaction. A high percentage of New Sessions means that visitors who land on your website visit multiple pages. It’s a measure of stickiness of your website. A low percentage means that the majority of the visitors don’t have multiple sessions on your website. Users don’t like having multiple sessions with your website. You have to make sure that the % New Sessions is high because it means new visitors are finding your website through search engines and are sticking to it. When a user doesn’t return to the search results page after clicking on your website, all things being equal, it’s a signal that they are satisfied. This satisfaction signal improves your website’s ranking. Google will push your website to the top with an intention to serve the best results that will satisfy users. To show you how impactful this can be, CognitiveSEO posted an article on Reddit one normal day. They received 20K new visits in a day from Reddit. But this increase in new sessions improved their website’s search engine ranking for a very competitive keyword. Yes, the web page actually jumped from position 74 to 8. Isn’t it awesome? 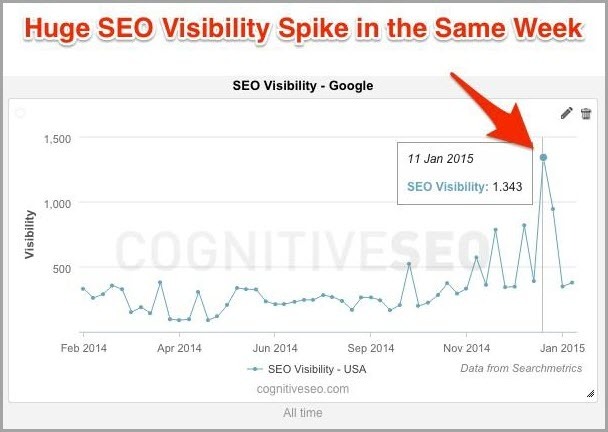 The search visibility spiked the same week. Interestingly, the bounce rate and the average session duration for this page was extremely low. A spike in the percentage of new sessions will surely give your website a great boost in SERPs. Because users want to discover new content that improves their lives in one way or the other. And if users are satisfied, Googlebot will likely be. Search engines try to serve pages that a lot of people are already visiting and are clicking on. For this reason, the title and meta description of your web pages should be beneficial and irresistible so that new visitors who find your listing in the organic results for a given keyword (e.g., content marketing strategy plan) can be drawn in, and click-through to your website. These two Google Analytics metrics are exceptionally powerful and are helpful in improving your search ranking. Why? 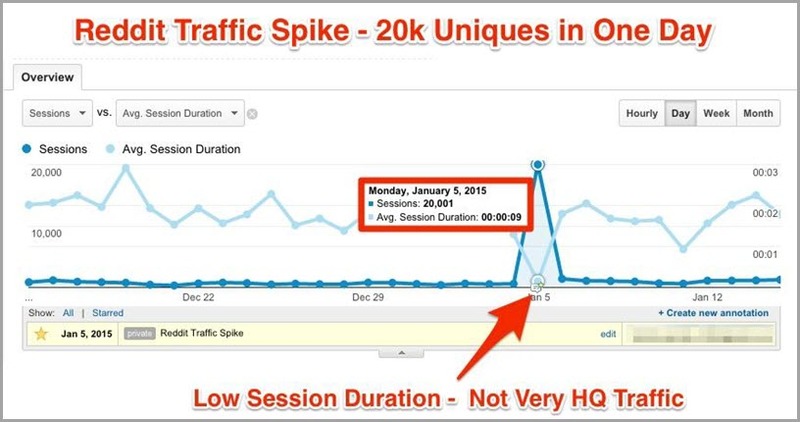 Because bounce rate and % New Sessions are direct signals from user’s behavior. Analyzing and making sense of these two metrics (and all the others) is your primary responsibility as a website owner or website administrator. From my personal experience, if you spend 80% of your time working on reducing your bounce rate and increasing % New Sessions, you’ll indirectly influence other metrics including page views, Avg. Session Duration, and Goal Conversion Rate. Next article Who should optimize content: SEOs or content writers?